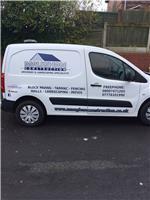 Maughan Construction - Driveways/Patios/Paths, Landscaper based in Bignall End, Staffordshire. Much of our work comes from personal recommendation. Whatever project you commission from us, we will use only the best materials, and deliver it to the highest standards. We only work from written quotation – no pressure selling, no hidden extras, no special offers if you agree to buy now. We arrange the work to fit your schedule. We provide a clear statement of both cost and time. If you have any special requirements, such as maintaining special access during the work, we will find a way to accommodate it. We always ensure our working sites are safe, clean and free of any danger. Any material removed is disposed of or recycled legally in line with local council requirements. Our work is covered by £1 million of public liability insurance. Idea to completion, we will help you. The work that we do, whether paving or landscaping, is likely to be a significant investment, and not the sort of job you will be tackling too many times. You may know exactly what you want, or just have a vague idea. Create a layout that’s both functional and elegant. Choose a style from a wide range of paving materials. Include original features that will make the site more appealing and functional. We will always provide a written specification and quote before you decide to employ us. Thank you for supporting your local company. Stoke-on-Trent, Staffordshire, Cheshire, Newcastle, Crewe, Leek Moorlands, Stockport, all other surrounding areas.